Contest: WIN: a Prestige 51" Sit Stand Desk Espresso! 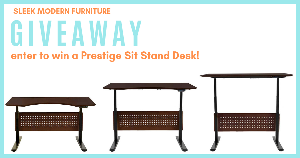 WIN: a Prestige 51" Sit Stand Desk Espresso! Prize: Prestige 51" Sit Stand Desk Espresso! This adjustable desk easily moves up and down with an internal electric motor.